I need motivation to "re-visit" the city I used to live in years ago. Although I have lived in the Virginia Beach/Norfolk area (Hampton Roads) before, being away for almost six years made me look at it differently. I'm proud of this little spot in Southeast Virginia, and I wanted to reintroduce myself to all the fun and local sites. 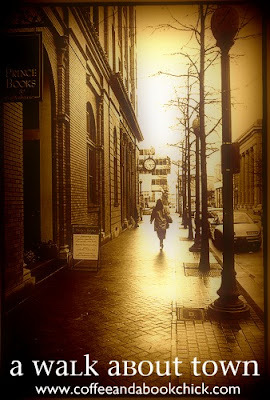 So "A Walk About Town," a new feature here at Coffee and a Book Chick, was born. For December, I'd like to highlight each week a place I've visited. After the month, I'll evaluate and decide if it will continue. Since I also travel frequently for work, I might also want to do a quick recap of something about the city that I enjoyed. No boundaries here, you know? And then I thought...about extending it out to anyone who may want to participate. So I've attached a Linky at the bottom of this post. For the month of December 2011, every Thursday (or Friday), I'll post about a place I've visited in the past week. Whether it's a book store, a restaurant, a movie theater, or a new shop I've been meaning to visit, I want to document it. The blog button in the sidebar is open for anyone who wants to participate. Those who do participate, add your post to the Linky below. You don't need to add a ton of pictures, or any at all. Do what you like. You don't need to join every week. Whenever you like. Just post your link to my weekly post. The picture above is actually of a street in Norfolk in front of Prince Books, an independent bookstore I'm featuring today. So that's the plan. I hope you'll join me as I'd love to take a peek into your local town, or a city you've visited! Imagine my delight when I learned that Norfolk, Virginia had an independent bookstore. With its warm and inviting atmosphere, a lunchtime café and a great bookstore staff, I knew it was going to be *the* place to go to for author events. Prince Books opened in 1982 and focuses on poetry, history, biography, boating, travel, and also features a children's section (along with YA titles). The books I bought were The Blind Assassin by Margaret Atwood, The Complete Fairy Tales by George MacDonald, and The Redbreast by Jo Nesbø. I cannot wait to attend the events they'll be hosting in 2012! Very cool new feature! I am excited about seeing where you have been in any given week! The bookshop looks delightful too, and your choice of The Blind Assassin was a good one. Aarti and I did a joint read of that book, and there was just so much there to discuss. I would love to hear what you think about it when you are done! Very cool! I am incredibly envious of anyone that has an indie bookstore. I will make sure that when I'm traveling or wandering around Orlando, I will keep this meme in mind. It is really a cute little shop! Btw. new follower, like the look of your blog, it is really homey somehow. I loved it there when I lived there - over 30 years ago. I'm sure it's changed quite a bit, so I'll enjoy your walk! What a great idea for a feature! I'll definitely be keeping this in mind as I go around town over the next week - so many beautiful & quaint places where I live. Oh I just read Rebreast. My first Nesbo book. I'll be reviewing it soon. Great picks!! What a fabulous idea. I love seeing the areas where people live. What a cool plan. I'm near D.C. I love the filters you put on your photos. Very vintagey. My mom and I are going out this week, so maybe I'll snap a few photos and post. I am so into this meme! Annie already posted this week but I plan on taking some pictures when I go to our town square today...will post next week!